My next project is something I’ve been planning for a while, but only have about a month left to finish! More than a year ago I bookmarked the painting “Portrait of a Lady with a Book, Next to a River Source” by Antoine Vestier, from about 1785. For the Rite of Spring Ball our Hopeless Romantics group is turning into “Our Favorite Things.” We are doing a “Girls in White Dresses with Blue Satin Sashes” theme for April. This dress is perfect, but now I’m running out of time! 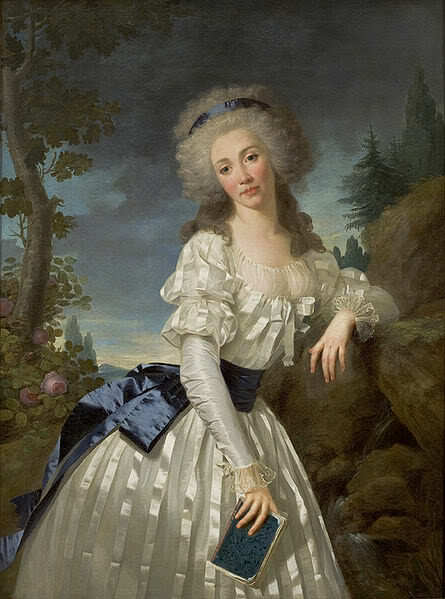 To recreate the outfit I will be wearing a cotton voile chemise a la reine, and a sheer striped silk overdress. I had a hard time finding the right sheer fabric. I found many fabrics where the stripes were much too wide, or much too thin, and most of them were synthetic. 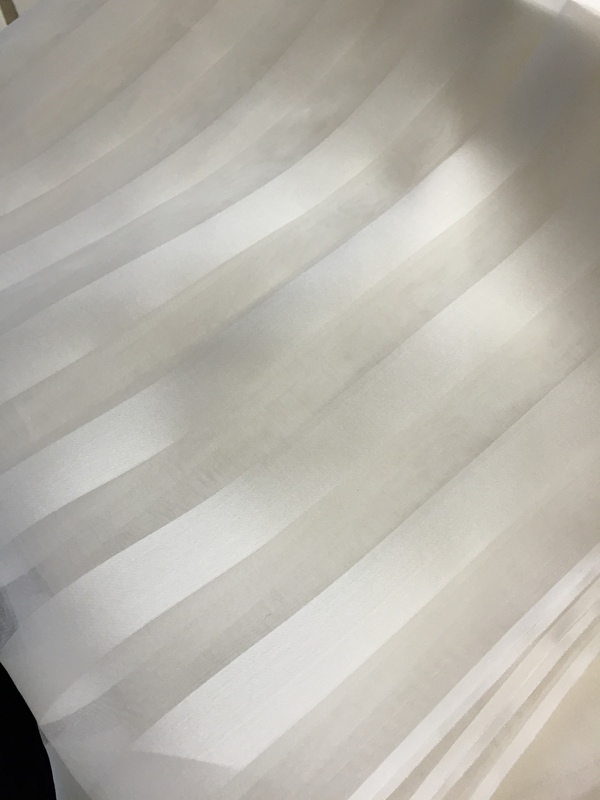 I finally found a 1 inch wide striped sheer silk organza in a nice ivory color. I am in the process of draping the voile. 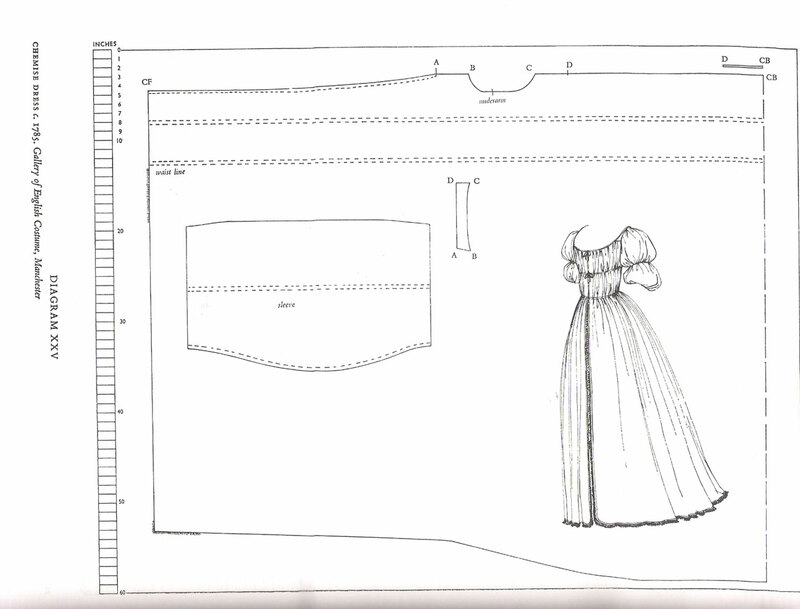 I studied a lot of blogs, and Nora Waugh’s pattern, but will be making my dress according to what makes sense to me (translation: what’s the easiest way), and combining construction ideas from various dresses. Posted in 18th Century, Girls in White Sashes with Blue Satin Sashes and tagged 18th century, chemise a la reine, sheer striped dress. Bookmark the permalink. You can do it! I’m excited to see how t turns out. I’m super excited to see yours too! Thank you for the encouragement! I hope it turns out as well as I imagine it! Oh what fun!!!!!! I am so excited to see this dress come into being!!! Hurry up now, so I can drool! The ball is my deadline so I hope I hurry too!